Talk of a recession dominated market analysts’ conversations during the swoon that started 2016, but after the market recovery that word started fading into the background. However, in addition to slowing jobs growth and weakening economic data, there is a huge reason to worry about a recession according to Deutsche Bank’s Joe LaVorgna — debt. A breakdown from analysts at S&P earlier this month found that corporate debt had risen at the 2,000 or so largest US firms to $6.6 trillion to end 2015, up from $3.8 trillion at the end of 2010. 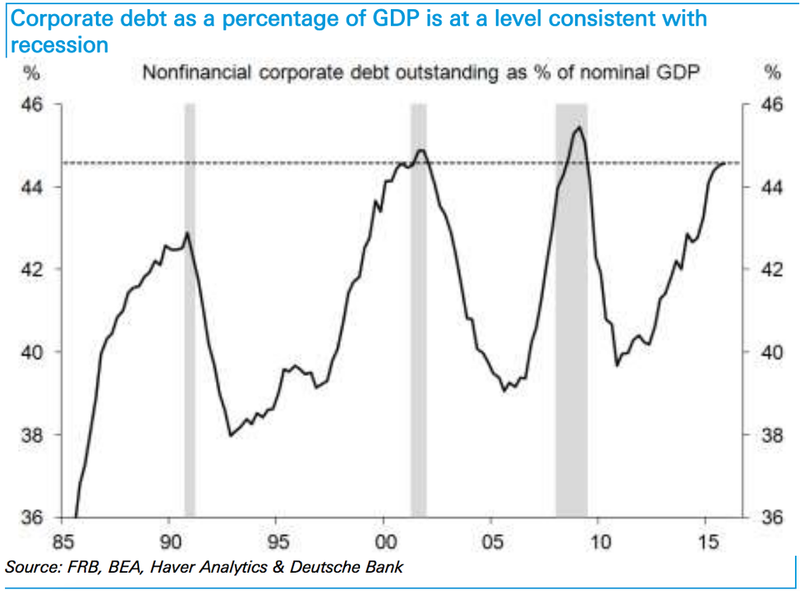 According to LaVorgna’s breakdown, corporate debt as a percentage of GDP has reached a level only seen just prior to the last two recessions and that has serious policy implications. 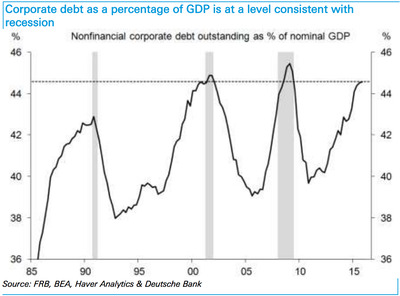 “The ratio of non-financial corporate debt to nominal GDP is at its highest level since Q2 2009, when the economy was still in recession and nominal output was substantially depressed,” he wrote. This also becomes an issue as the cost and standards for lending become tighter. As we noted, the most recent report on bank lending standards showed loan officers tightening those standards. As LaVorgna outlines, with the amount of much debt outstanding, this tightening of conditions could have a huge impact. “An over-tightening of credit conditions would be problematic for a highly levered corporate sector, especially if final demand were to remain weak,” he said in the note. The idea here is that as it becomes more expensive for companies to service debt, they will cut back on labour costs. In turn, consumers stop spending as they get worried about their jobs, and this decreases income for businesses creating a cycle of slowing ending in recession.